Well, what does this show? Foreshadowing I think. Things were going downhill early and they just got worse and worse. After what happened at Lowe's at the end of the year, the drivers and teams were probably wishing they were just left fighting those early fires. Where do we start? Well, I think the debacle that was ASA in 2004 in the hottest ticket of the talk-town. It was one of the biggest newsmakers in the Short Track world, not only for ASA racers and fans, but for all of the racers and fans in the other series that compete with and against ASA. How does a Short Track series that has led the way, from popularity to innovations to prize money, fall apart so quickly? Well, the book on how to do it was written and written well this year; authored by Steve Dale. 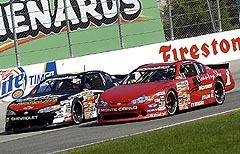 - there sits a bunch of talented drivers out there that now are looking for somewhere else to showcase their talents. And they will. But it is too bad that they can't do it where they have been doing it for years. - there sits a bunch of equipment out there with no place to race it. Those who can will buy new equipment and race elsewhere, but what about those who can't afford to just up and buy new equipment to race in another series? Wow! It is hard to believe that another Short Track racing year has come and gone. And all of us armchair racers have sat around and watched all of these races unfold on television or in person, and what we haven't seen, we've read about here on the internet somewhere. So it is the perfect time for a look back. 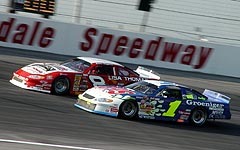 A look back to what was, one of the most interesting Short Track seasons in many moons. Remember all of the uproar of the speed of the big tracks and how dangerous they were especially after two big accidents that resulted in two drivers spending time in the hospital? Remember the technical issues? Two different drivers, both high in points, were fined money and points for things that were questionable at best! Remember changes to the “looks” of the ASA cars? Oh yeah, how could you forget that! - there sits a bunch of talented race officials and motorsports personnel with no jobs. Where do people like Ross Wellman and all the others go that have spent so much time trying to make ASA what it was? - there sits a bunch of disheartened loyal race fans, who have watched and stuck with ASA racing during their lives, but now have to start watching the competitors. And look at all the after-effect the fall of ASA has had. Teams have closed down. Drivers and team members have lost their jobs. ASA officials have lost their jobs. 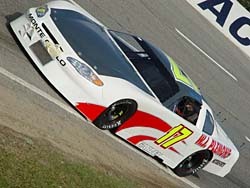 Without major sponsorship, many people are left wondering where they are going to race in 2005 and beyond! While I'm not going to pick on Dale, it was pretty obvious that things were things were heading downhill pretty quickly and things should have and could have turned out much different if handled more properly. While the money problems take the cake, things were pretty rocky all year long. Remember back at the first race of the year when all those rule changes came on during the first driver's meeting without little discussion beforehand? 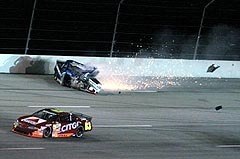 Remember all of the uproar by the drivers after the first couple races and how many cautions and wrecked racecars were being left behind? But enough about what is wrong in the business. How about what is right! I personally think one of the biggest and coolest things to come out of 2004 was the ABC Body deal. Even though a lot of the talk about the ABC Body deal came out in late 2003, we all got to see it put to good use in 2004.
all over the country. That era just might be coming back. A pat on the back to everyone associated with this. Look at IRL/CART or even the Dirt Late Model world. Too much separation isn't good. Great years abounded in many series. The ProCup Series had a great year and 2005 looks to be only better with the influx of ASA guys that are bound to show up in the land of Hooters. They've got TV (even though the production looks bad on TV compared to the other series we see); they've got title sponsorship; they've got a great championship formula that provided a great battle in 2004; they've got great car counts and they've got the championship money. ProCup is looking to fill that spot that ASA will now relinquish unless a miracle is around the corner. The Sunoco Super Series, well, now the CRA Super Series, had a great year too. It may be the best touring Super Late Model series in the country. However, let me get on my soapbox for one second.... Sunoco? What the hell? They said they are leaving to invest more in being the “official fuel of NASCAR. That is the mindset that will kill short track racing. 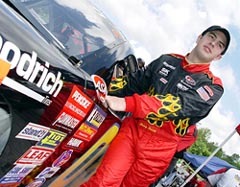 You had a great thing with the Sunoco Super Series. And I'm pretty sure there wasn't a multi-million dollar contract there to be the title sponsor. But, it is just another company drawn to the “NASCAR” name. Take note. This won't be the last. How about NASCAR? What is happening with the Touring Series? We've expected some major announcements and they haven't come yet. The one thing we know is that something needs to be done. They've started and they're trying... NASCAR that is. It started with the All Star Showdown that was first established last year. That was a great thing. I've heard there are some flaws, including location and money paid, but how great is it to see six of the Touring Divisions on LIVE TV. And they've brought in Don Hawk to help the Touring Series. From what I hear, he is a guy that knows his stuff. He is well respected in the Cup community and has been for years. However, there are plenty of problems. Money is a big one and we all know that. And, if the “realignment” of the Touring Series happens, with two Mod divisions, two Elite Divisions and two Grand National divisions, there are going to be a lot of people wanting more of it. And NASCAR is going to have to ante up and pay more. Think of the Midwest guys. How many of them are going to run the full NASCAR Elite East Division (or whatever they call it) and come to Myrtle Beach from Wisconsin for a $4,000 to win show? Not many. Hell, there weren't even many takers in Super Late Model class from the South when there was a $25,000-to win show in the north this year (in Unity, ME). There needs to be TV too, not just for the Grand National Division, but for all the divisions. They all deserve it. They've all worked to get where they are. NASCAR has lots of money and lots of influence... they just need to know that they need to use the money and influence on everything that falls before the Craftsman Truck Series and not just on the “big three.” Hopefully, with some of the moves they've made, they're on their way to doing just that. There are so many stories and things I could cover here. There were great, breakout years by all kinds of drivers and individual racing series. Congrats to all of the champions in all of the series’. Conrgrats to all of the race winners. Congrats to everyone who participated, from winning races to winning consis to missing the show; everyone of them stepped up and followed a dream, no matter how much money they had in their pockets. That is what keeps all of us excited about what we love so much.